We have some recommendations for Baby Bugs Bunny items that will be helpful in decorating the baby’s Looney Tunes nursery or filling a gift basket for a Baby Bugs and Baby Lola Bunny baby shower. Cartoon fans will be happy to know that their favorite rascally rabbit has his own line of products that will fill many of your wall decorating and gifting needs. Baby Bugs Bunny and Tweety pictures are readily available to decorate your nursery walls in a bright and cheerful fashion. You can get a lot of decorative mileage out of inexpensive posters that you frame yourself in black poster frames and you can fill all the spaces in between with Bugs Bunny stickers. 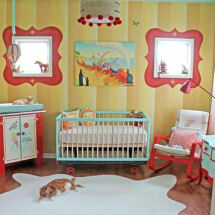 Removable wall decals are a nice way to customize your kids' furniture as well as the walls and ceilings. For a few dollars you can have the headboard of the baby's bed, a toy box or the front of a dresser decorated in just a few minutes. There are cute Bugs Bunny lamps with Bugs alone that would be so cute for a baby boy’s nursery. For a gender neutral nursery decorated with Bugs and other Looney Tunes characters, there are nursery lamps with both Baby Tweety and Bugs Bunny stuffed animals displayed on the base with images of them printed on the lampshade as well. You might also consider Baby Bugs and Baby Lola bunny items for a shared kid’s bedroom. 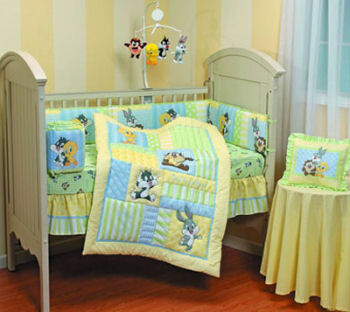 You may find a few crib bedding collections that offer a variety of decorative accessories including a crib mobile decorated with stuffed Bugs, Sylvester, Baby Tweety and the Tasmanian Devil Looney Tunes characters. But your best bet in getting the color and style that you want may be to buy some Looney Tunes fabric and make your own or have it custom made. You can even make your own baby mobile using stuffed animals that you buy yourself. Stuffed toys are more than likely the first thing that jumps into your mind when buying a gift for a baby or kids belonging to fans of Looney Tunes cartoons. There are so many uses for a plush Bugs Bunny or Tweety, it’s true. But I like to include stuffed animals as part of a complete package where I have arranged several unique items in my Looney Tunes baby nursery theme. For instance, pictures of Bugs Bunny, a Looney Tunes pacifier, infant onesie and items that will complement the Baby Looney Tunes crib set and accessories make a very nice presentation when arranged in a pretty basket. Those are just a few products that are readily available in your local discount store. If you are into crafts, your options will be much wider. Return to Unique Baby Gear Ideas to see more Looney Tunes nursery decorating tips.